The membrane is represented in light brown. A transmembrane protein (TP) is a type of membrane protein spanning the entirety of the biological membrane to which it is permanently attached. That is, transmembrane proteins span from one side of a membrane through to the other side of the membrane. Firm attachment of TP to biological membrane is aided by a special class of membrane lipids, called annular lipid shell. Many TPs function as gateways or "loading docks" to deny or permit the transport of specific substances across the biological membrane, to get into the cell, or out of the cell as in the case of waste byproducts. As a response to the shape of certain molecules these "freight handling" TPs may have special ways of folding up or bending that will move a substance through the biological membrane. Transmembrane proteins are polytopic proteins that aggregate and precipitate in water. They require detergents or nonpolar solvents for extraction, although some of them (beta-barrels) can be also extracted using denaturing agents. All transmembrane proteins are integral membrane proteins (IMPs), but not all IMPs are transmembrane proteins. 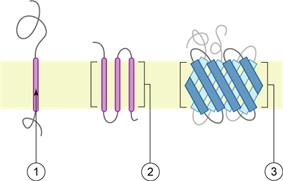 There are two basic types of transmembrane proteins: alpha-helical and beta-barrels. Alpha-helical proteins are present in the inner membranes of bacterial cells or the plasma membrane of eukaryotes, and sometimes in the outer membranes. This is the major category of transmembrane proteins. In humans, 27% of all proteins have been estimated to be alpha-helical membrane proteins. Beta-barrel proteins are so far found only in outer membranes of gram-negative bacteria, cell wall of gram-positive bacteria, and outer membranes of mitochondria and chloroplasts. All beta-barrel transmembrane proteins have simplest up-and-down topology, which may reflect their common evolutionary origin and similar folding mechanism. This classification refers to the position of the N- and C-terminal domains. Types I, II, and III are single-pass molecules, while type IV are multiple-pass molecules. Type I transmembrane proteins are anchored to the lipid membrane with a stop-transfer anchor sequence and have their N-terminal domains targeted to the ER lumen during synthesis (and the extracellular space, if mature forms are located on plasmalemma). Type II and III are anchored with a signal-anchor sequence, with type II being targeted to the ER lumen with its C-terminal domain, while type III have their N-terminal domains targeted to the ER lumen. Type IV is subdivided into IV-A, with their N-terminal domains targeted to the cytosol and IV-B, with an N-terminal domain targeted to the lumen. The implications for the division in the four types are especially manifest at the time of translocation and ER-bound translation, when the protein has to be passed through the ER membrane in a direction dependent on the type. Transmembrane α-helical proteins are unusually stable judging from thermal denaturation studies, because they do not unfold completely within the membranes (the complete unfolding would require breaking down too many α-helical H-bonds in the nonpolar media). On the other hand, these proteins easily misfold, due to non-native aggregation in membranes, transition to the molten globule states, formation of non-native disulfide bonds, or unfolding of peripheral regions and nonregular loops that are locally less stable. It is also important to properly define the unfolded state. The unfolded state of membrane proteins in detergent micelles is different from that in the thermal denaturation experiments. This state represents a combination of folded hydrophobic α-helices and partially unfolded segments covered by the detergent. For example, the "unfolded" bacteriorhodopsin in SDS micelles has four transmembrane α-helices folded, while the rest of the protein is situated at the micelle-water interface and can adopt different types of non-native amphiphilic structures. Free energy differences between such detergent-denatured and native states are similar to stabilities of water-soluble proteins (< 10 kcal/mol). Refolding of α-helical transmembrane proteins in vitro is technically difficult. There are relatively few examples of the successful refolding experiments, as for bacteriorhodopsin. In vivo, all such proteins are normally folded co-translationally within the large transmembrane translocon.The translocon channel provides a highly heterogeneous environment for the nascent transmembane α-helices. A relatively polar amphiphilic α-helix can adopt a transmembrane orientation in the translocon (although it would be at the membrane surface or unfolded in vitro), because its polar residues can face the central water-filled channel of the translocon. Such mechanism is necessary for incorporation of polar α-helices into structures of transmembrane proteins. The amphiphilic helices remain attached to the translocon until the protein is completely synthesized and folded. If the protein remains unfolded and attached to the translocon for too long, it is degraded by specific "quality control" cellular systems. Stability of β-barrel transmembrane proteins is similar to stability of water-soluble proteins, based on chemical denaturation studies. Their folding in vivo is facilitated by water-soluble chaperones, such as protein Skp . ^ Steven R. Goodman (2008). Medical cell biology. Academic Press. pp. 37–. ^ Jin Xiong (2006). Essential bioinformatics. Cambridge University Press. pp. 208–. ^ Almén MS, Nordström KJ, Fredriksson R, Schiöth HB (2009). "Mapping the human membrane proteome: a majority of the human membrane proteins can be classified according to function and evolutionary origin". BMC Biol. 7: 50.